12 students around a table (and another in an adjoining room) working, chatting, laughing and having fun. What a joy for a teacher to work with a group who all got on well together, who were enthusiastic, and who shared their successes (and problems) freely. 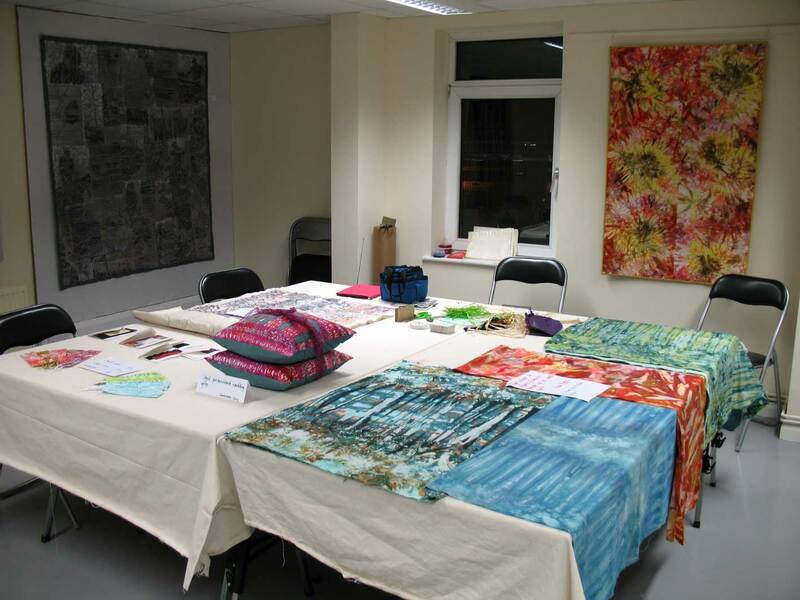 I have just returned from teaching the Contemporary Quilt Group Summer School which this year was based at Zinc Arts in Essex. 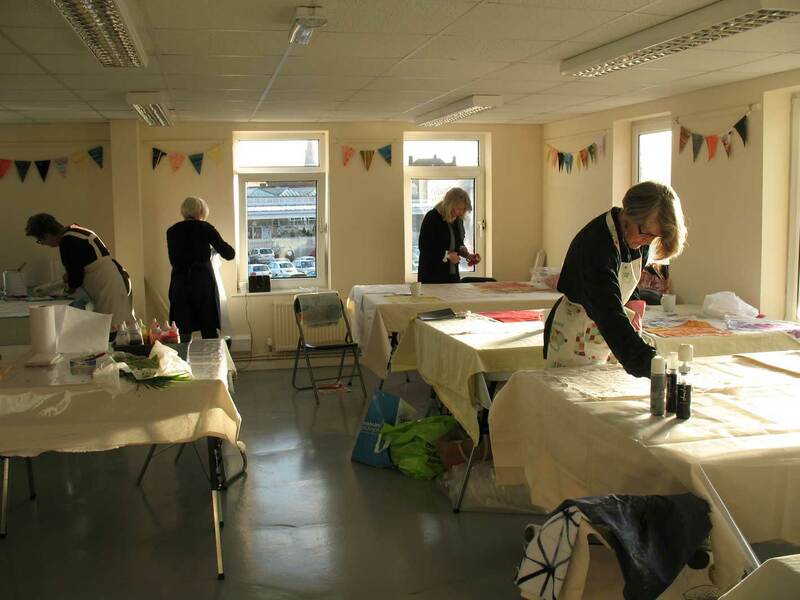 The Centre was well equipped and we had plenty of space to spread out in – though not quite enough tables so we raided the cafe area for some extra ones for the sewing machines! 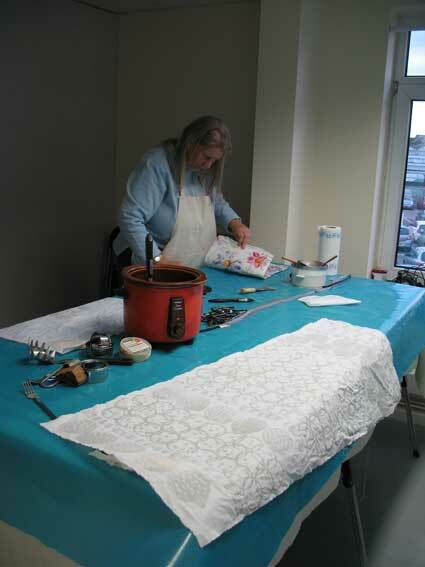 Jo Lovelock, who was teaching the other course, was not quite so lucky with her space which was rather smaller for her dyeing class, but they still had loads of fun. 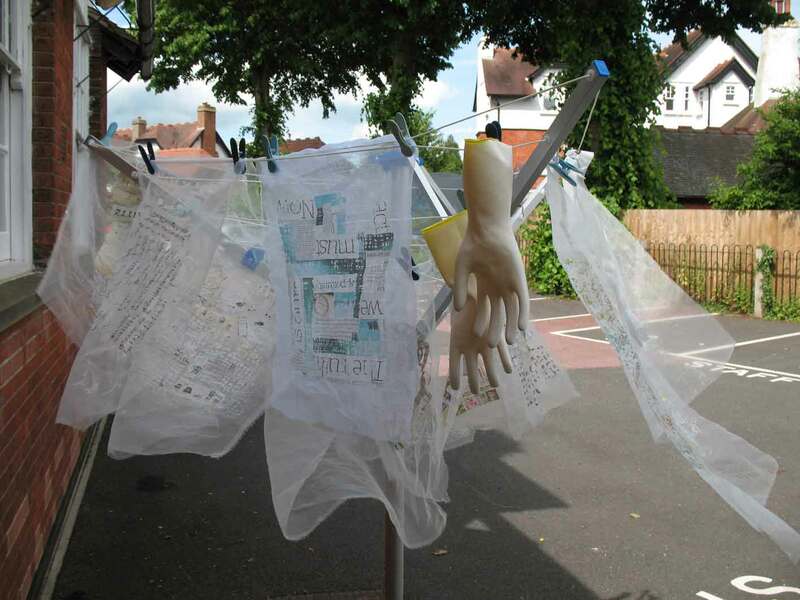 We were able to hang work outside as the weather was so good for drying – except for the occasional downpour! 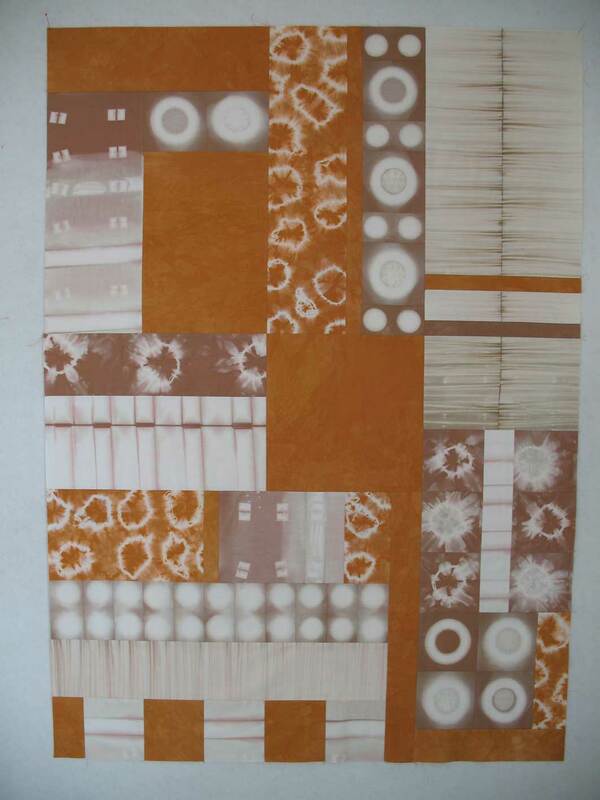 And not quite sure about the mixed media value of the rubber gloves! I taught Paper Lamination – on to transparents, on to solids, and gesso lamination, finishing off the weekend with some ideas about how to stitch and work with mixed media fabric. It was really rewarding to see how everyone produced such different work throughout the weekend, despite all starting from the same point with the same instructions. 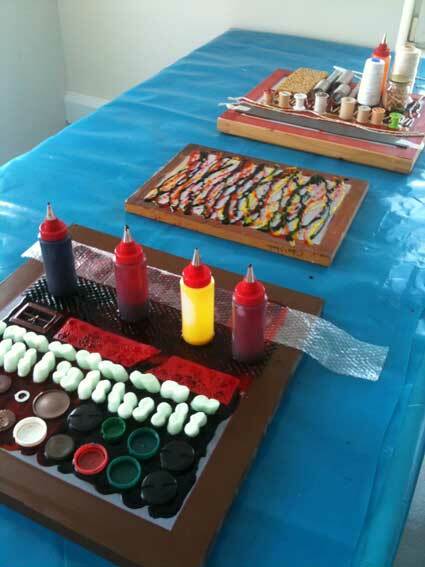 I have included below, some examples of the work that was done. I had a fabulous weekend, enjoying the teaching, the company, the students and the venue. Thanks to Dani Atkinson of CQ for making the whole weekend run very smoothly too. Wow what a week we had – full of colour, fun, laughter and work! 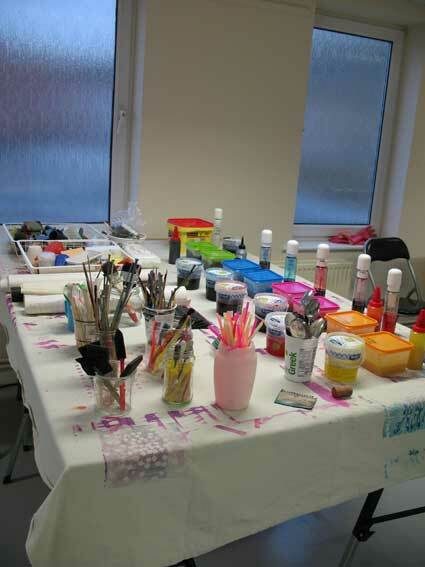 Studio after 2 full days of colour work – what a transformation! And what a generous tutor Leslie Morgan is. She spent the week talking with us about colour and sharing her years of knowledge and experience, so that by the end we were beginning to understand our own colour preferences and uses. 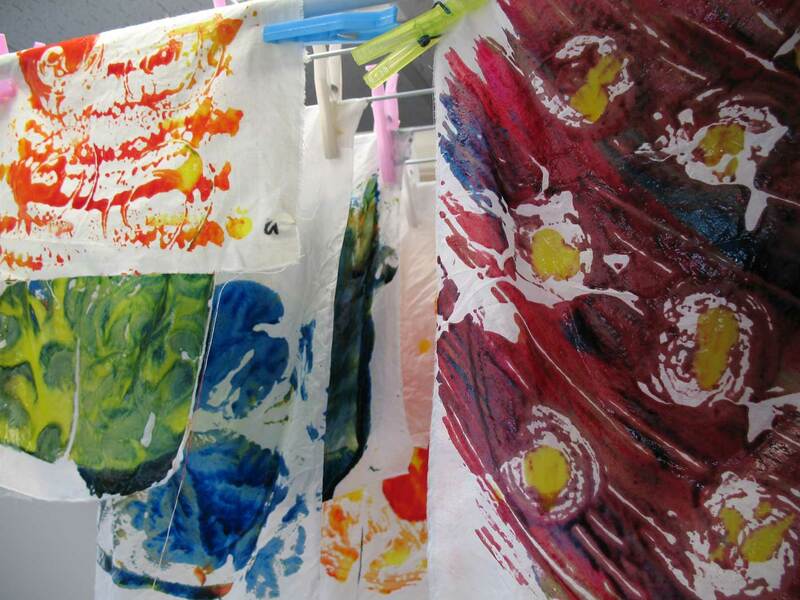 We began the week just mixing colour on palettes, working intuitively from a fixed starting point. We had been asked to bring a colour source and this helped us determine which colours to start with. 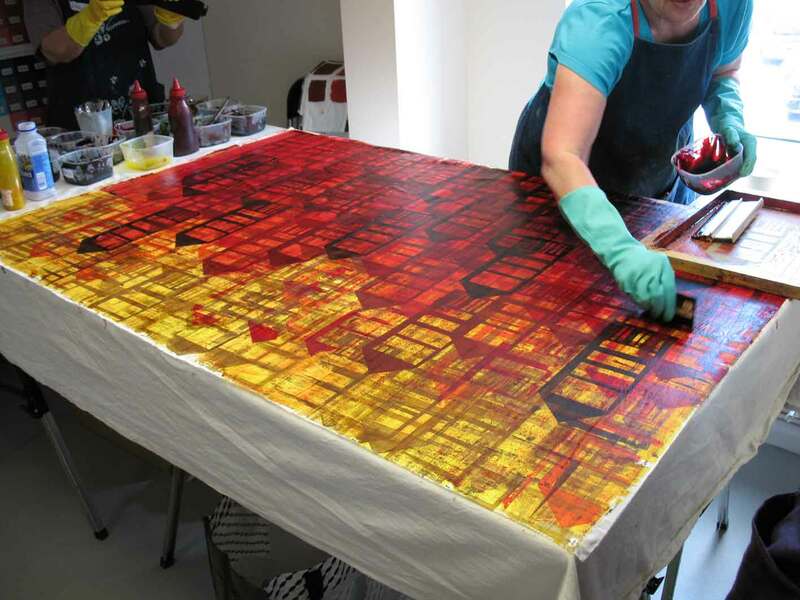 We worked with thickened dye paints and print paste to create layers of transparency and tone within the colour we were mixing. We had many many colour charts on the wall to help us understand particular blends and mixes of colour and tone, and provide us with a language of colour for the week. But for some reason on that first day, the words kept coming back to ‘sage green’! On day 2, I think it was Gill who actually turned up in the morning with a sage leaf for comparison and lots of giggling. 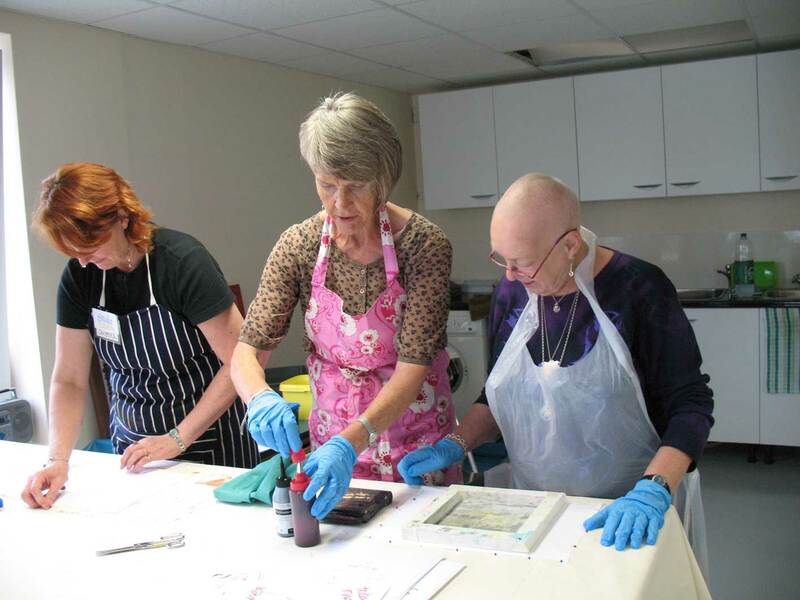 The second day was spent with Leslie showing how to mix a range of 15 colours just using 2 to start with and print paste for tones. Its easier than it sounds but does take a huge amount of concentration otherwise the wrong colour ends up in the wrong pot! As the week progressed we created cloth from scraping off the palettes, credit card wiping, thermofax printing, and screen printing. Both conventional and unconventional ways of printing! 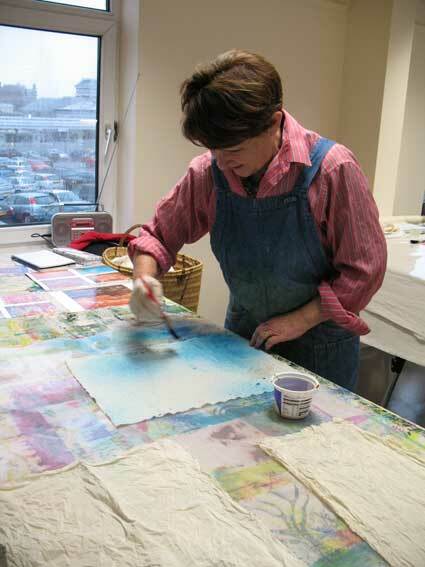 We watched Leslie demonstrate how she layers up colour on fabric using just one screen and a credit card – a hugely inspiring demo. Of course, there is always a downside to any course – and washing out 15 pots of colour each time you wanted a change of colourway was it! (No pictures of that!!) But that was a SMALL price to pay for a fabulous course, with a great bunch of people. Thanks. 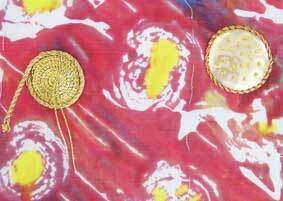 We have just finished our second weekend of Open Houses, with the Studio open Saturday/Sunday, 11-5 each day. Its been lovely meeting new people, sharing how we work and what we teach. 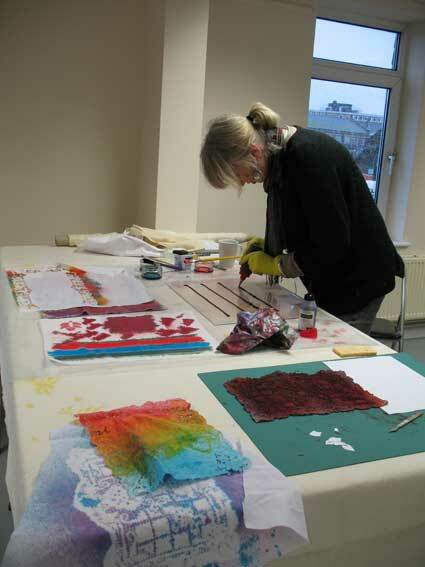 Each day we have had friends in to demonstrate various processes: printing, mixed media, wax, dyeing. 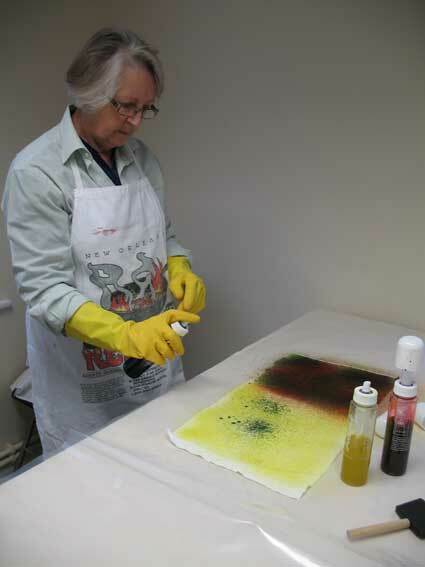 Here is Sally concentrating on creating lots of circles on black cloth with wax, which she will then take home to discharge with Milton sterilising fluid. 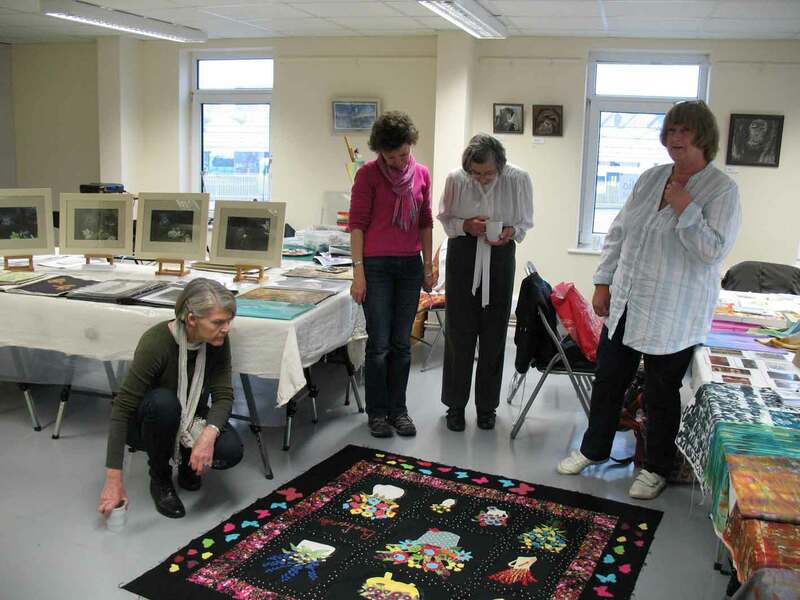 I even had my local quilt group – Collective Purple – in for a cup of tea and a chat. 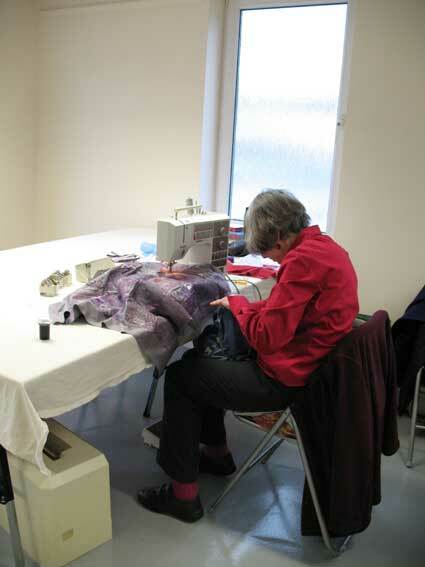 We looked at Gill’s new quilt which she has been making with Mandy Shaw, and which we all love with its pink bluebells and purple primroses – completely whacky but beautifully stitched and put together. 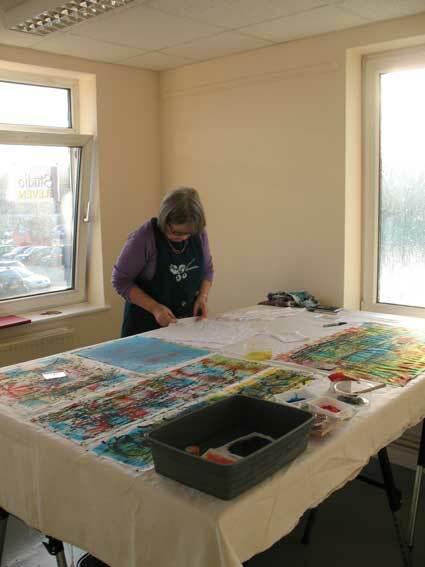 Roz has some fantastic images of Rhinos on display and is currently working on a painting of some beautiful wild cats. 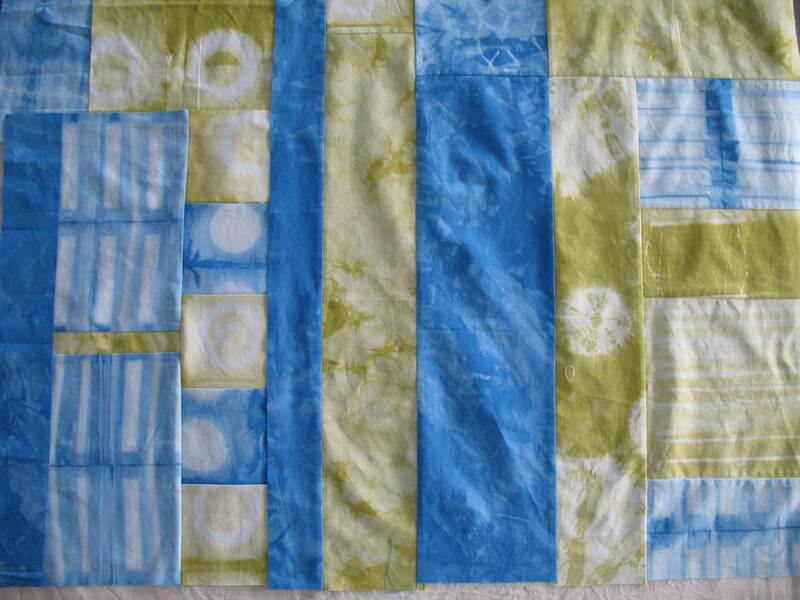 I have a couple of new studio quilts as well as a completed Story of A Beach, which I am thinking of entering into Festival of Quilts this year. And we both have cards and smaller items (prints/scarves/aprons) for sale. And of course, as usual, there are some fabulous home made cakes for sale, even if I do say so myself! If you have not been already, why not come along next weekend 10/11 May. 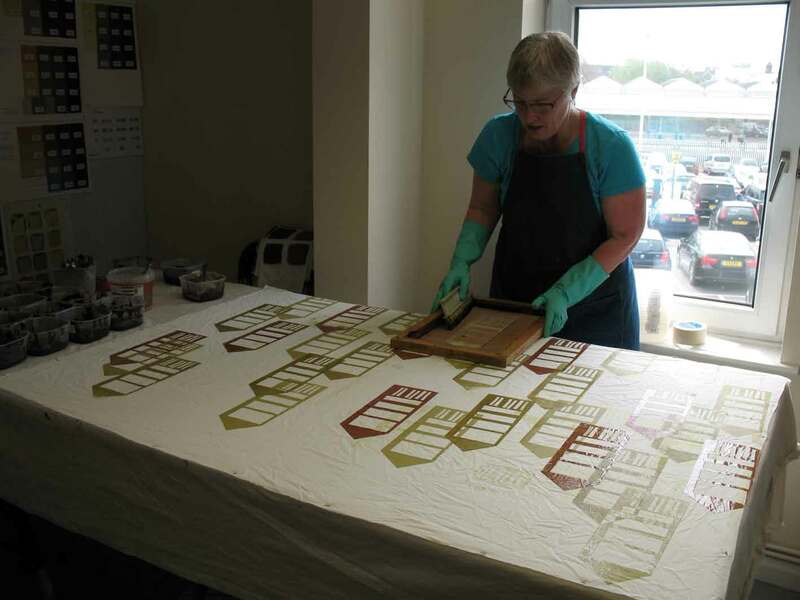 Roz and her students are busy preparing for their end of year exhibition which will take place this weekend (29 & 30 June)! The exhibition will be opened,at 3pm on Saturday by a special guest: Trevor Weeks MBE who founded the Wildlife Rescue & Ambulance Service (WRAS). As Roz is a Natural History Artist, there will be opportunities to support the WRAS which is a cause close to her heart. 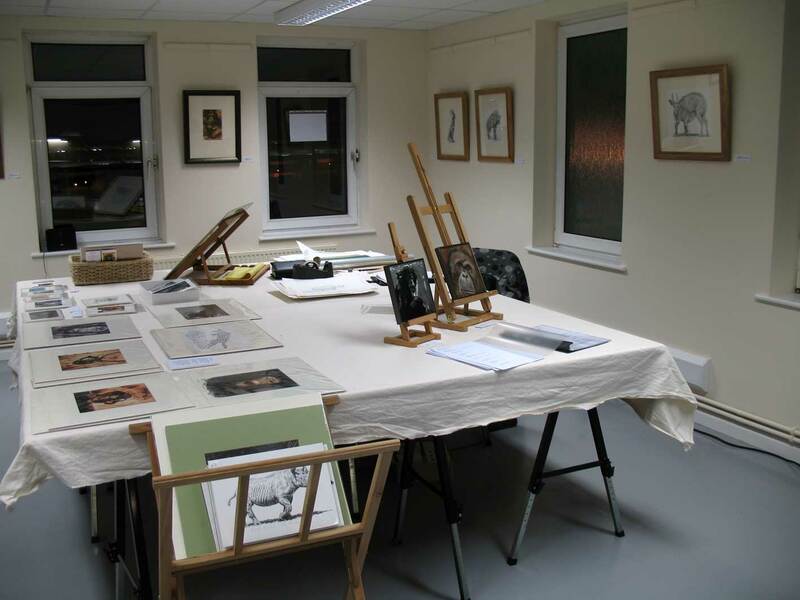 The Studio will be open both days of the weekend between 11am and 5pm with lots of work to look at, students to chat with and of course Roz will be there to answer any questions and take bookings for September starts, or summer schools! Roz runs lots of different drawing and painting classes and if you want to see what is going on, the exhibition is a good way of doing that! You will see lots of different styles, processes, and abilities represented. 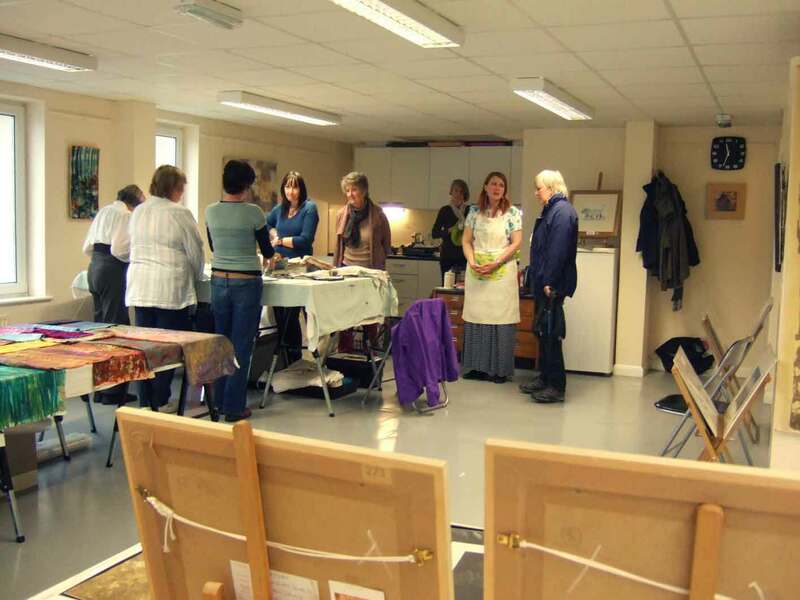 Beginners are very welcome as well as the more experienced. There are classes for everyone. New Term and a New Year Starts! Well this is going to be more about the old year ending really! What a fabulous start to the Studio. 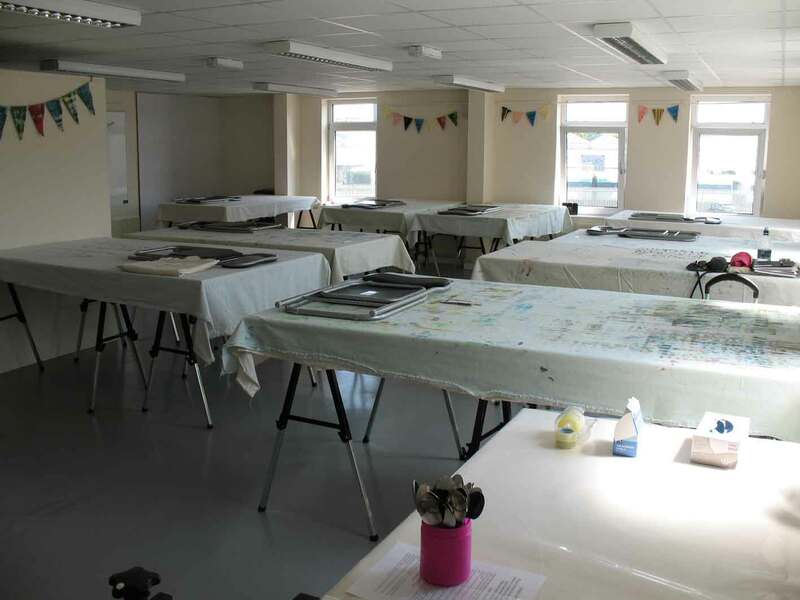 Roz and I have both now completed a term of teaching in the Studio and found it to be a wonderful space to work in – students constantly comment on the quality of the light and the view. Despite overlooking the train station, it is so lovely not to be face to face with another building. And there is always something to watch outside – not that there is much time for any of that! 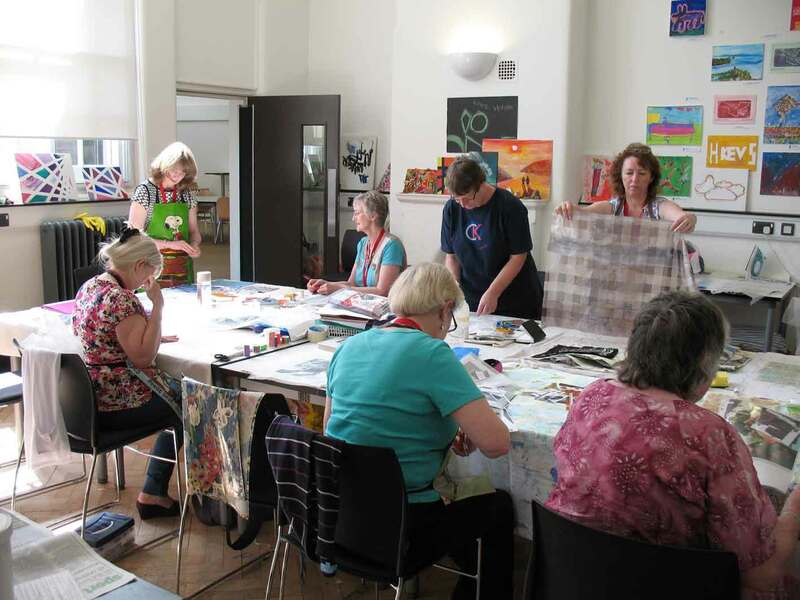 My Friday Colour To Stitch group have now completed one project – their mini quilt, and started on another one – an embroidered print. 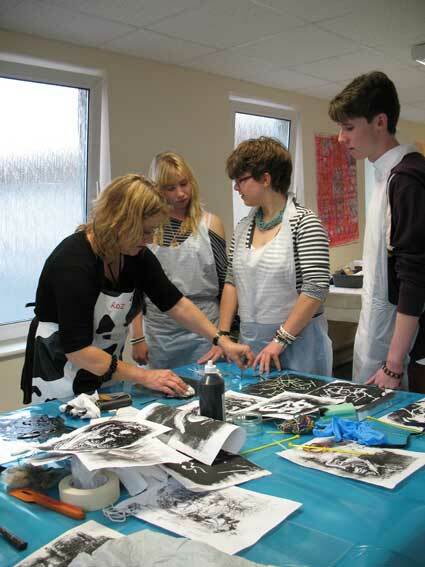 The printing was done amidst much fun and laughter and some lovely prints were made. I am looking forward this week to seeing how they all turned out and what prints are going to be chosen to take forward to the stitching phase. The Saturday personal development class all do a variety of different projects – some students have spent their term stitching projects, others have explored the variety of wet print options available to them in the fully equipped studio, and some have come with firm intentions and projects to work through. 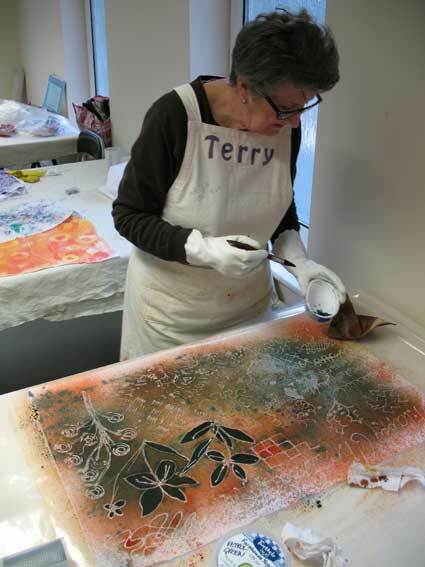 And Mondays are a riot – an energetic class where it is all about wet print and dye work. So we have tried out tying and clamping, tray dyeing, spraying & painting dyes, and now we are embarking on screen printing and a variety of techniques you can use with the screens. There is not much time to draw breath on a Monday but everyone goes away with lots of fabric, quite a few rolls of plastic that the fabric is wrapped in, and the satisfaction of having learnt another few techniques and created some beautiful unique fabric to work with. And of course at the beginning of December, Roz and I took part in the Eastbourne Christmas Open House event and had a lovely weekend chatting with people and showing our work. We intend to open the Studio again after Easter as part of the Festival Open House event and we will have a new member of the studio joining us: Elaine Cameron will be working with us and showing her collaborative art work that has derived from her recent MA. If anything has caught your fancy in this post, or pictures, please do use to Contact form to e mail me and I will get back to you straight away. There are still places on most courses and I have new students joining all the time. In fact there is one new student coming along to the Monday class this very week. Looking forward to the New Year and all the fabrics that are going to be made in that time. Wow what a day! Started early fixing final things – putting the hose on the sink for the screens, laying out the refreshments, putting up our banner to hang from the windows. We had lots for people to do and to look at. 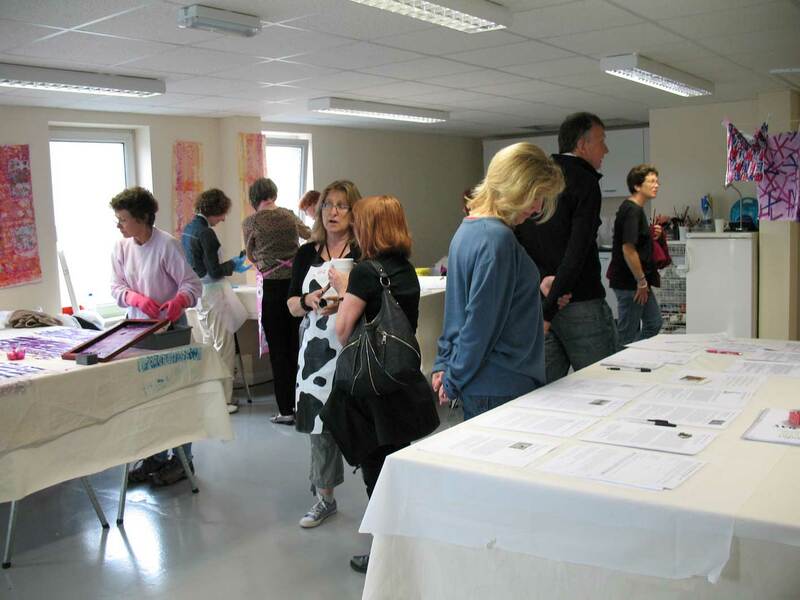 And then from about 5 minutes past 10 people started arriving, Roz and I started talking with people, Hilary and Sally were helping out demonstrating watercolour resist and screen printing, Judith was doing refreshments and Anita had gone off to the town to deliver leaflet to the Art Stalls. And we just didn’t stop till about 1.30! We had some of Roz’s students come and see the new studio they were moving to. They all seemed very impressed with the facilities. The loos proved to be a great hit and somewhat of an improvement on the farm studio convenience! We were visited by the Chairwoman of the South East Region of the Embroiderers Guild, who wanted to speak with me about teaching at West Dean next year. Jackie stayed for quite a while watching proceedings, looking at some of my samples and generally soaking up the atmosphere. Some Twitter friends came to look at the facilities. 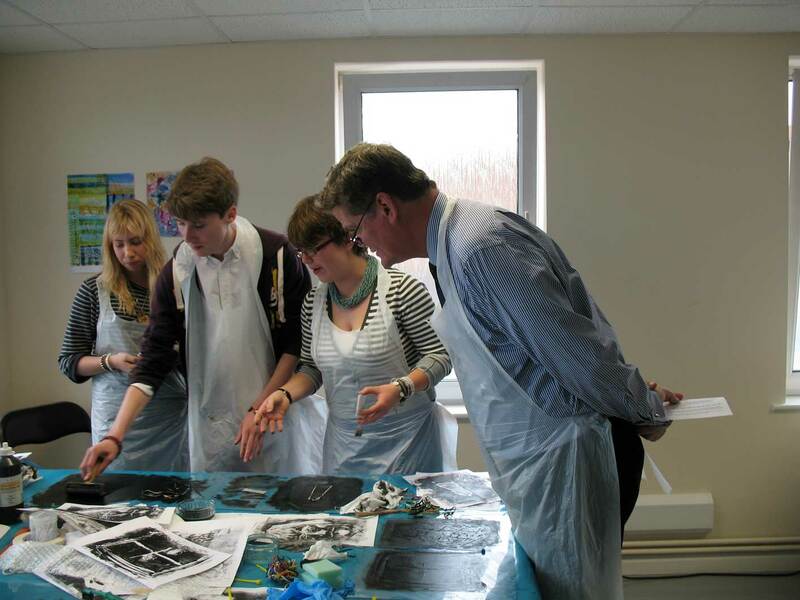 @CohubStuart (and Laura) and @TheatricalEB who came and had a go at monoprinting and seemed to thoroughly enjoy herself. Some ex students and friends of mine came to see what I was getting up to now I have moved from my nearly full time job at Sussex Downs College, to a very part time role. A photographer came from the Herald to take photos. We thought they would co-ordinate with the visit by the MP but he was more interested in the fact we were in the old Beckett newspaper offices. 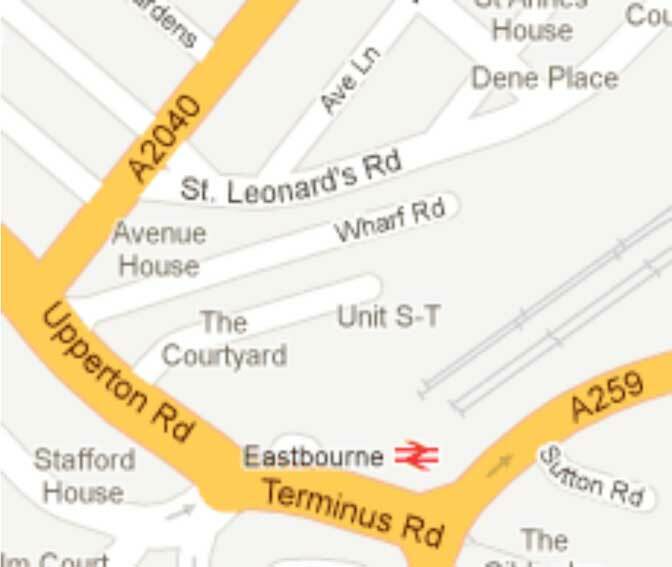 In fact we seemed to be based in the old advertising offices. And then Stephen Lloyd MP came. He came on his own, took off his jacket, ‘rolled up his sleeves’ and fully entered into the spirit of the day. 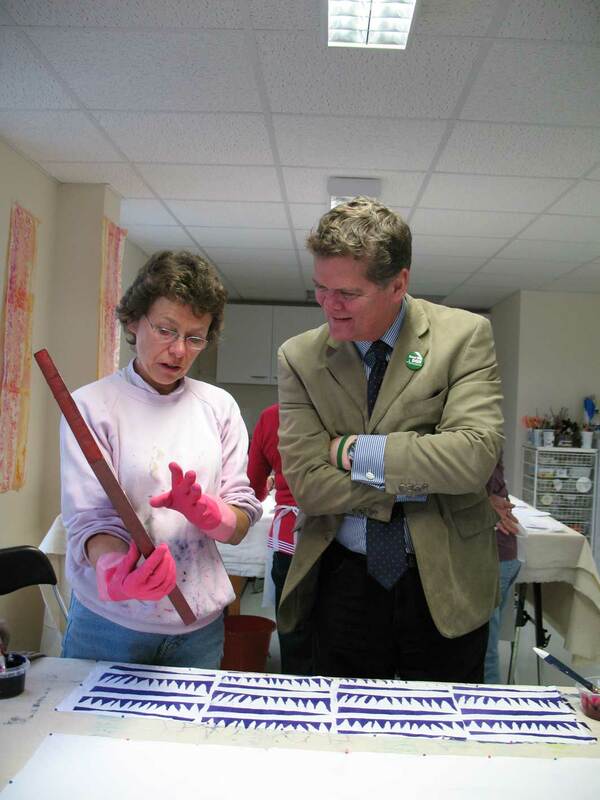 He chatted, laughed a lot, watched, questioned, was genuinely interested in what we were demonstrating, and even had a go at screen printing himself. Amy went out into the Arndale Centre and town centre to hand out leaflets and some interested people came in to have a look in the afternoon. Altogether we probably had about 60 people through the doors, which kept the studio busy all day, with just a short break around lunch time when it quietened down and we were able to have something to eat! We were still going strong when it was time for it to be all over! It took a while for the clearing up to happen – of course – always the worst part of any party! And for one small person in particular, this meant an added bonus and something more to play with. 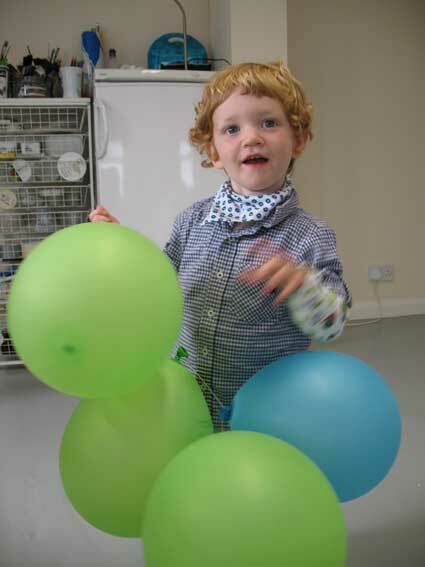 Oscar playing with our brand colour balloons! See you in class maybe! 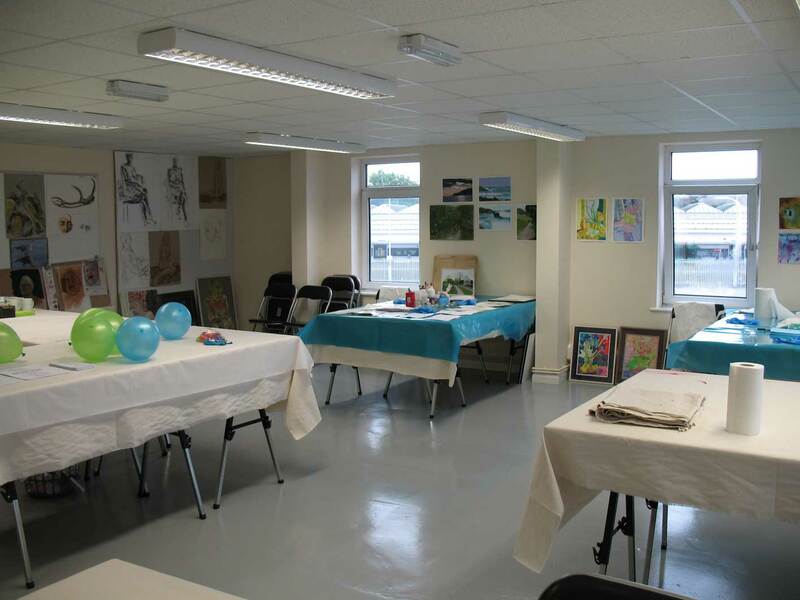 We are opening the studio for the whole day and inviting anyone who is interested in learning about drawing, painting or textiles to come along and see what the facilities in the studio are like. We have asked some of our friends and students to demonstrate some of their favourite processes, and talk about their work and classes. 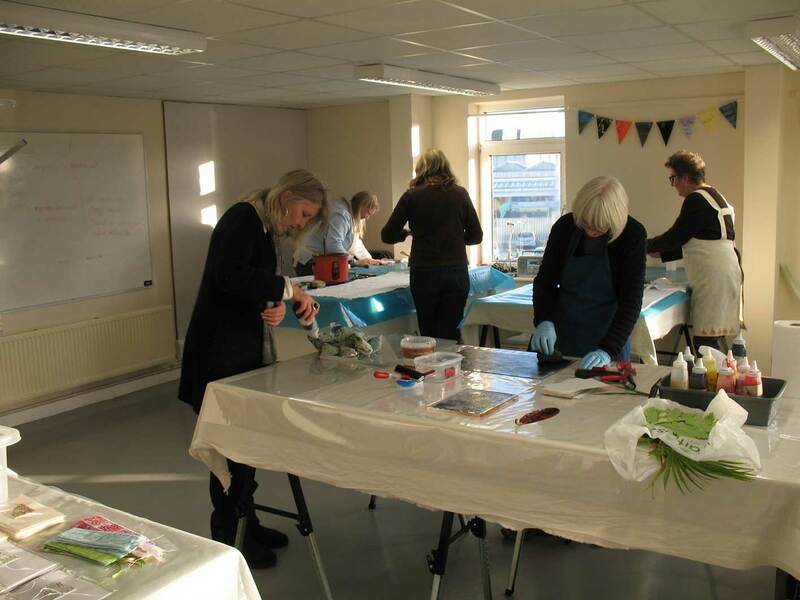 The local MP, Stephen Lloyd, who is very supportive of the arts in Eastbourne, is coming along at 3pm to see what the facilities are like and how we encourage complete beginners to engage with learning arts and crafts skills. I think its a brilliant way of showing people the lovely airy light studio and this unique private facility for art and textile students. 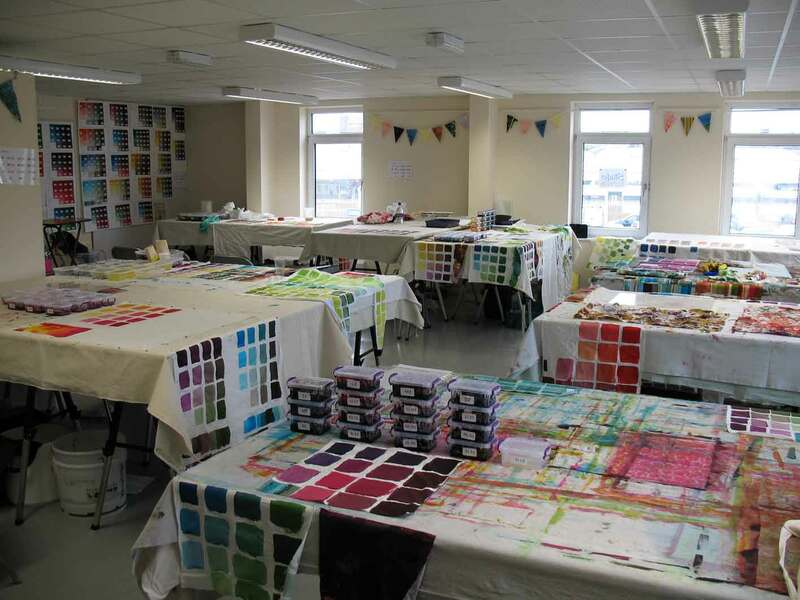 We have space enough for 10 textile students to have a 2m bench all to themselves, allowing the printing of full width cloth in 2m lengths with the minimum of trouble. In preparation I made some breakdown screens today. The question is….what do you think they will look like once printed on the fabric? Why not come along and find out on Saturday 1st September! 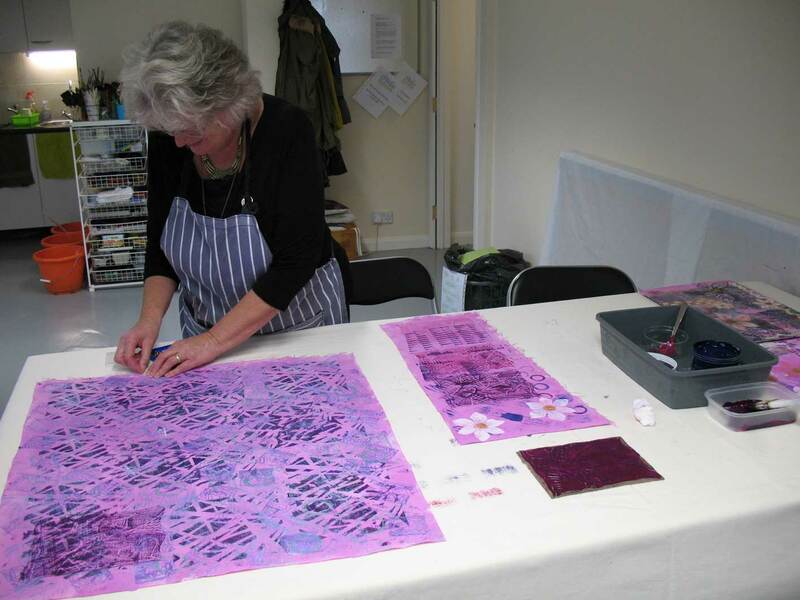 You might even be able to print part of the fabric from these screens for yourself, or try a small screen and take away a piece of fabric to make up into the centre of a cushion, or bag. We will also have some tea and cakes available for refreshments, though we will ask for a small contribution towards the cost of these. Last summer school is now finished and we had a great time. 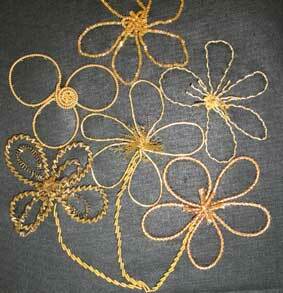 There is such a lot to learn in Goldwork that even a 4 day course can only be an introduction to the subject. 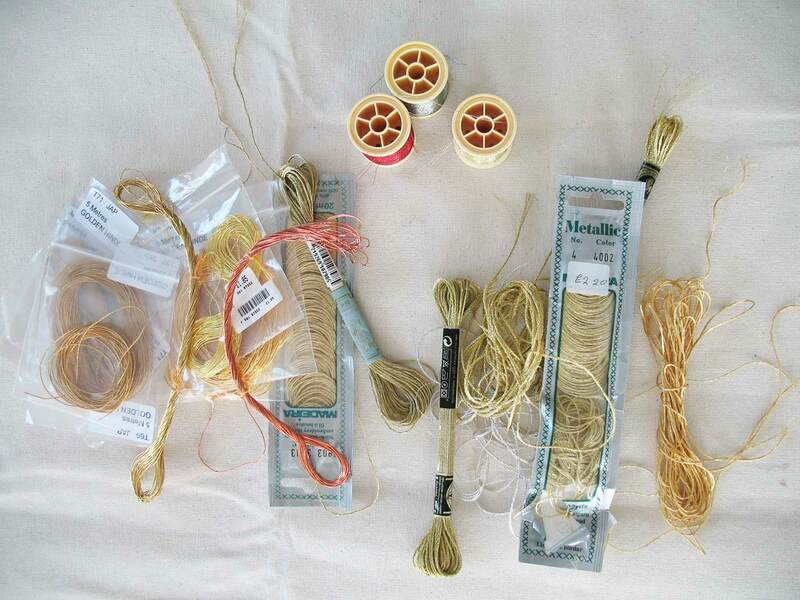 We started with materials and equipment. We had a table full of different types of metal thread, each of which has a particular character, and a particular problem when using it! After nearly a day of preparation – printing/padding/dressing the frame – we finally got down to working with the metal threads themselves. We covered several basic techniques dealing with each of the main types of metal thread and had the luxury of some time to sit and stitch and practice the technique, rather than having to leave it to go home and then forget how to do it! 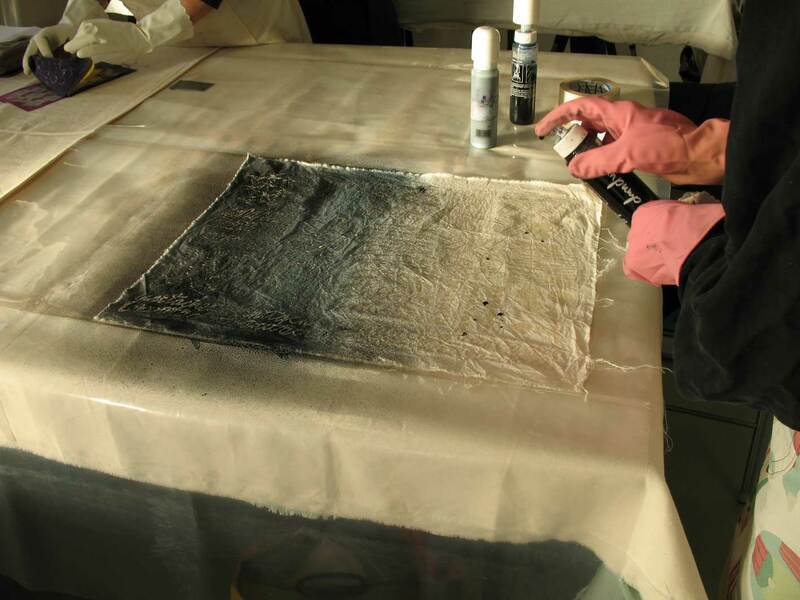 Alongside the traditional techniques, everyone had a go at some more contemporary treatments of the materials and by the end of the course, most people had 2 samples on the go and in some cases, nearly finished! As a teacher it is exciting for me to see a lot of different styles and choices of design and stitching emerging throughout the duration of the class, creating a lot of very individual pieces of work, despite the fact these were only samplers really. Coffee and cakes throughout kept us all very happy and content over the 2 weeks and it felt as though I had been teaching at the studio for years, rather than only 2 weeks. 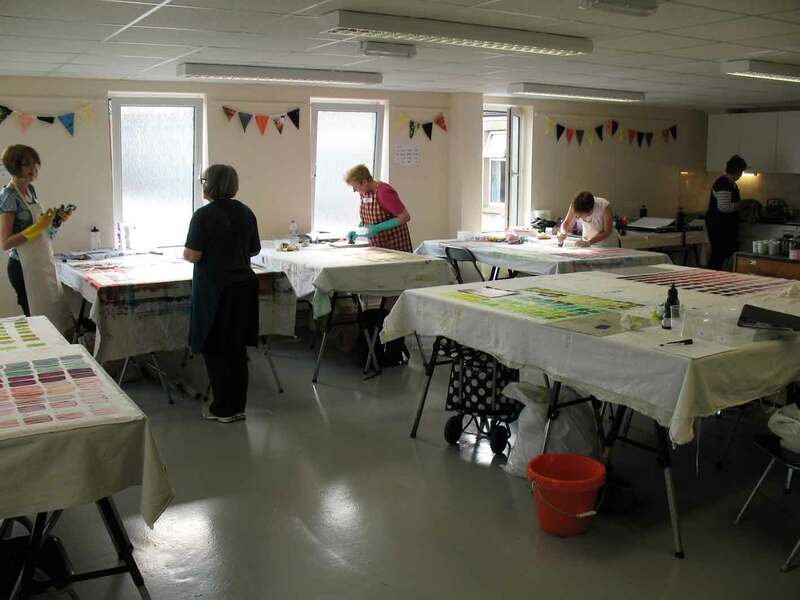 It is a lovely flexible space which can accommodate a pure stitch class as easily as a wet print/dye class. I really enjoyed myself and I think the students had a good time too! The week ended last week with the Introduction to Goldwork class where surprisingly (for the students anyway), there was little work with actual metal threads till after lunch on the 2nd day! 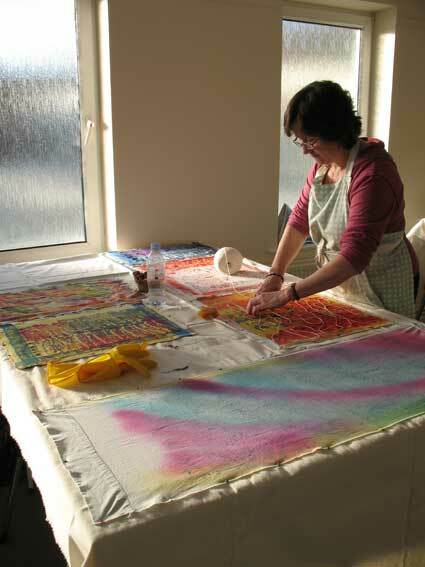 That is because the first day was spent being introduced to all the materials and then having fun with printing to make some backgrounds for the goldwork itself. 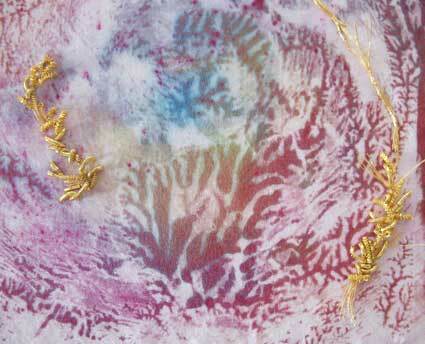 A lot of fun but no goldwork! After the frames were all set up to go, the paddings had to be applied ready for the various types of gold to be worked over the top. Never mind, almost solid gold work over the next 2 days on Thursday and Friday. Some experimental and some traditional! We now only have one day left on the Tie Dye Mini Quilt and these have come a very long way – mostly the tops are together ready to be put into a quilt sandwich tomorrow. They are looking really exciting!